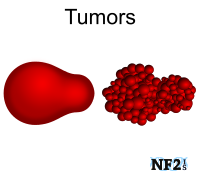 While NF2 tumors are not just limited to Vestibular Schwannoma, these tumors damage hearing and balance issues directly, but other issues also develop. Facial Nerve damage can also develop as a result of proximity to the Vestibular Nerve. Damage to this nerve is not just about the cosmetic issue of droopy facial expression, but eye issues, nasal issues, speech and eating are also issues. The content of both of these presentations at the Ohio Gathering is a discussion for general information only and should not be considered medical advice. Patients and families need to consult individually with qualified health care professionals regarding their own specific treatment plans. None of the drugs mentioned in this presentation are approved by the FDA for the treatment of VS. This transcript was produced from the Computer Assisted Realtime Translation (CART) and is not a verbatim record and has not been proofread. The following transcript is provided as a courtesy rough draft of PRI Court Reporting, LLC courtesy of Andrea Crago. Steve: Hello. Could everybody have a seat, please? Good morning and welcome. Good morning. I hope everybody had a good sleep last night. It's a good turnout this year. We are having our 10th anniversary of the Ohio Gathering. It's a wonderful thing that my wife does putting this thing together and works so hard to get everybody together once a year to enjoy a good time. This morning, first off, we have Dr. Stephen Smith speaking. That's spelled with a P-H. He specializes in facial reanimation, facial surgery and plastic surgery, reconstructive surgical procedures, athletic injuries, facial injuries. He is Phyllis' doctor, and in fact Phyllis has a surgery with him on the 22nd of this month to correct a facial problem. We are just getting things set up here, and Dr. Smith will be speaking. Thank you. Dr. Smith: Good morning. Thank you for inviting me today. It's nice to be part of this event. I am very impressed with what Phyllis has put together. I have a fellow this year, somebody who is spending a year with me. He is actually from Montreal. I will make sure you meet him, Steve. I don't know why he isn't here. He took a call last night so maybe he is in the OR. I am going to speak about Facial Paralysis. I have been director of facial plastic surgery at Ohio State for seven years now. I work a lot with Dr. Katz, and I have worked a lot over the years with Dr. Welling. I know that Dr. Welling's presence in our community has led to our opportunity to help take care of the Neurofibromatosis 2 patients. It has been a pleasure to have met some of the people here in the audience in my practice. I see a lot of facial paralysis, mainly because of head and neck cancer. 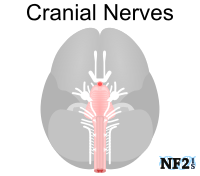 But on occasion, we will also see it from Neuro-Otologic procedures from Schwannomas, not related to NF2. Certainly the facial nerve is affected in Neurofibromatosis. In Asia, they treat facial paralysis a little bit differently than we treat it, as you can see. I do not employ any of this walnut-based therapy in my practice. But it's interesting that if you look into management of facial paralysis around the world, there are different strategies. I won't go into too much detail here other than to just let everybody know that the facial nerve is not just a motor nerve. It doesn't just control the movement of the face. It also has taste fibers and sensory fibers, as well as fibers that stimulate some of the glands such as the gland that produces tears and some of our saliva. The nerve enters the facial tissues from the cranium, or the skull via the ear and it travels through a Parotid Gland and innervates the muscles of the face. We think about it whenever we do surgery on a face because it's something we don't ever want to injure when we are doing our facial procedures. 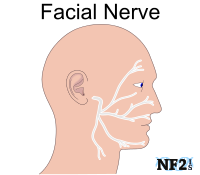 The facial nerve has very important motor functions, as you all know. Our primary concern when a facial nerve isn't working is protection of the eye. A dry eye or an ulcerated eye, as Dr. Katz will get into great detail with; can lead to vision-threatening problems. So when I have a patient present to me with a new facial paralysis, I will often get him involved or do something to temporarily or permanently improve the ability of the eyelids to protect the surface of the eye. But the things that I am most commonly involved with are oral competence. That means the circular muscle around the mouth; we want to keep it up and intact. Also a facial nerve is important for the tone around the nose. And so if the muscles on the side of the nose are weak, people often experience nasal obstruction. Then certainly there are the implications of a facial droop and the appearance of a facial droop can lead to concerns about self-image. So when we have a patient present, we have to figure out why the nerve isn't working. And we think of lots of different things. We will sometimes use imaging, CT scans, MRI's. But usually we will rely on a history of physical exam to start and try to get an understanding of what's going on. And then if the nerve is not working, we try to figure out what part of the face is affected and how we can help that patient restore function of their important facial areas: Nose, mouth, eye. There are a multitude of imaging studies that can help us understand how a facial nerve is injured. And then there are some more sophisticated testing that we'll sometimes order to figure out issues related to the nerve and its various branches. This is just a piece of paper, or a page from a textbook that shows you all the different etiologies of facial nerve paralysis and looking for neurofibromatosis on the list. It's right there. Neurofibromatosis Type II. Neurofibromatosis Type II is just one of the many, many reasons people experience weakness or paralysis of the facial nerve. When Dr. Welling, Dr. Katz, or I are evaluating our patients with facial nerve weakness, there is a scale, a House-Brackmann scale. There are probably some folks in this room who have seen Dr. Brackmann in California at House, Brackmannout in California, who are neurologists and Dr. Welling's colleagues. We rate the weakness of the facial nerve with this scale. And this is something, it's important to teach our residents. But the key area we typically look at is -- it won't show up, but if the weakness is a III, people can still close their eye. If it's a IV, it means the eye closure is incomplete and it means we ought to do something pretty quickly. There are different types of nerve injuries. Nerve is one of the slowest tissues in the body to regrow. It regrows at about a millimeter a day. And it's a long pathway. It goes all the way from the inside of the brain all the way to its targets. This is not some kind of heavy science here, just some of the names of different types of nerve injuries. This is one of the studies that are sometimes performed, an ENOG. What that tells us is how weak that nerve is. Sometimes we use EMG, and that tells us if the muscles that are not being supplied by the nerve anymore would be good recipients for a nerve transfer. But let's talk about the nonsurgical management. What are things we can do that don't require a surgery to help folks with a facial nerve paralysis or weakness? The priority is eye protection first and foremost, so if I see a patient before they have an opportunity to get to Dr. Katz, I will make sure that the surface of the eye is protected with lubrication, moisture chamber. Sometimes there are little weights you can stick on the outside of the eye that will help the eyelid close before a surgery procedure. Some centers are fortunate enough to have physical therapy specialists to help folks with facial nerve weakness so that they can work with the physical therapists to strengthen some of the target muscles and develop some compensatory mechanisms in order to improve their function. One of the most common things in my practice is using therapeutic Botox. And it's something that's covered by insurance in our facial paralysis patients. But it helps me to improve the symmetry of a face. It helps me weaken some muscles that are pulling things in the wrong direction. Sometimes folks will have a facial nerve that works really well in one area. In fact, almost spasm muscles, and then be weak in other areas. So we can balance things out with therapeutic Botox. For instance, if you have a muscle that's pulling your lip down, if we put Botox in that area, we can bring that lip back up. When we do nerve graphs, we hook one nerve to another, which is difficult in neurofibromatosis 2 because both nerves might be involved. So rerouting the nerve is not a great option for the neurofibromatosis 2 community. But when we do graph nerves, what we are trying to get is that House-Brackmann regrade, meaning they can protect their eyes. Some of the procedures we use are hooks and hook nerves back up together. We will put cable graphs in, which means we will take a nerve from an arm or a leg and bypass the area that isn't working. We also will transpose muscles. We will - - we use a lot of bone-anchored screws to hike things up. And there are lots of little procedures we can do to move tissue around to improve the position of a weakened face. This is just a cartoon depicting hooking a nerve up back together. When we do graph, we do take the nerves from the arm or the back of an ankle. And in some situations, we are able to graph a nerve from one side over to the other side. But that's the exception rather than the rule. If I had somebody who is interested in that procedure, I have a colleague in Boston who we make a referral to. This is a very common procedure for Dr. Welling, and that's using the nerve to the tongue in hooking it up to the nerve to the face, so that people can have tone, protection of the eye, and better position of the mouth. Let's talk a little bit about -- this is a situation where a patient had a facial nerve paralysis where the nerve from one side was grafted to the other side, and then a muscle from the thigh was put up into the face and hooked up to blood vessels, and it allows him to bring the corner of his mouth up. One of the problems with these procedures is they take a long time. This is after two, two-and-a-half years. So you have to wait for the nerve to take, and then you hook the muscle up. There's usually an 8 or 9-day hospitalization after the second procedure. And then you have another long waiting period for the muscle to innervate and start to work. They also tend to be pretty bulky. There is a lot that can go wrong along the way. It's not a perfect procedure yet. But folks that do a lot of these have good outcomes. This is the traditional procedure for helping the position of the corner of the mouth. That's taking a strip of muscle, one of our chewing muscles called Temporalis, and flipping it down and grabbing some of the tissue by the corner of the mouth so that patients can, when they bite down, they can smile. It's a pretty bulky flap, and it doesn't always reach. So sometimes you'll end up with a crease out here and not necessarily in a natural position. Too gory? I do have some graphic pictures here. I'll go through them quickly. Or I'll tell you to look away. Does anybody want to see surgery pictures? Dr. Smith: Fine. I'll warn you. If you choose not to see it, that's fine. But we make an incision up here. We go down here, and we want to graph some of the tissue of the skin. After this procedure, people go home that same day. You can stay if you want, but we don't make you. But we take this muscle, and we are bringing it down to the corner of the mouth. Dr. Smith: There is a pretty prominent crease here. He is able to hide it with a mustache. Speaker: What can women hide it with? Dr. Smith: Not perfect, but better. That procedure that I showed you that was open like that, we now do through the mouth. So we don't have to make that big incision. But we rely on the tendon of this muscle, and we actually remove it from the jaw bone and bring it down to the corner of the mouth. But again, you can see that deep dimpling there. That's one of the down sides of the procedure. But it's an improvement of function. This is an old-fashioned technique. We don't use it anymore. And there's really been an evolution of -- I am going to go through this quickly. This is Dr. Katz's area. When I do those, I am usually just helping him with this area here called the mid-face. A lot of times when Dr. Katz is working to improve the position of the lower eyelid, there are lots of things working against that eyelid, pulling it down. Kind of like a kid hanging on a window treatment. So one of the things that I do to help him is I will recruit this tissue up and support it so he has an eyelid he work with that doesn't have a lot of tension on it. And a technique he and I have been working on evolving over the course of time, over the last six years, is using bone-anchored screws. And what we will do is, Dr. Katz will provide me with access to the bone here; and what I do is, it's kind of like a tent post with its cords. We are able to anchor a suture, a permanent suture into the bone. You can't ever feel it. We can take the permanent sutures and grab muscle and bring things up, or bring the corner of the mouth up. It's a great procedure because it doesn't take us very long to do, so the patient isn't exposed to an extended dissection or hospital stay. And it allows us to adjust the position of the corner of the mouth as well as the position of the mid-facial tissues. This is Dr. Katz's initials, so we have to mark the patients. And he is gaining access to this bone here so that I can anchor things up. So this is -- that's our permanent suture, and it's sitting in the bone, here. We use a little drill to gain access. So there's a little titanium screw there with the sutures coming out. And this is just at a week, but you can see the position of the corner of the mouth is much better. He is still quite swollen. We removed a little bit of upper lip skin to address some of the redundancy, but it certainly is very helpful. There are other things that we can do. We can reposition the nose with those bone anchors, the corner of the mouth, the cheek. And there are lip reduction procedures. We have a whole host of adjuncts we can use. I gave this talk a year ago as well out in Colorado, and this is Logan STEEVER. I work with the wrestling team a little bit, too. And was a wrestler myself. That's why that slide is in there. That concludes my portion of the talk. And really, kind of my take-home would be that the bone-anchored technique is a very viable technique, especially for neurofibromatosis 2 patients because it's adjustable. It's not a big dissection. It's a same-day, go-home surgery. Some of the down sides are suture fatigue, overcorrection, meaning we pull things up too tight. Sometimes over the course of time, the suture will loosen up. But it's something that can be repeated down the road and adjusted. So I will turn things over to Dr. Katz, and then I'll stick around and answer questions when he is done with his talk. Thank you. Steve Lee: Thank you, Dr. Smith. That was very interesting. Almost wants me to get my face done. Steve Lee: Good morning. I would like to introduce once again Dr. Katz. Dr. Steven Katz, spelled with a V, for the first time at the Ohio Gathering. Dr. Katz specializes in eyelid diseases, orbital -- you have to help me here - Paraneoplastic Syndromes, and reconstructive surgical procedures. Dr. Katz did his pre-graduate study in Canada. Vancouver, VC, yea! And you're up. Thank you very much. Dr Katz: Well, thank you very much for inviting me to be here. I know Steven and Phyllis Lee very well. I think they provide tremendous service in the community. It's an honor to be included. Like Dr. Smith said, I think we have a tremendous exposure to this community because of the presence of Dr. Brad Welling at Ohio State. He is a nationally known expert in this field. And because of him, we see a large patient population. I think we are also exposed to a lot of nerve paralysis because we have a very large skull-base, head/neck cancer teams. Dr. Katz: I'm going to focus on Ophthalmic Complications in Neurofibromatosis Type II. I'm not going to get into diagnostic criteria. I think there's a large spectrum of disease. No two patients are alike. 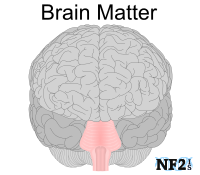 The vast majority of patients with NF2 have Bilateral Acoustic Schwannomas. About half have developed tumors in other cranial nerves, which can lead to double vision or sometimes compressive into your optic nerve, or perhaps tumors of the meninges of the brain, some of which will affect the orbit and eye. Children may show cutaneous Neurofibroma and sometimes we have to differentiate Neurofibromatosis Type I and Type II. 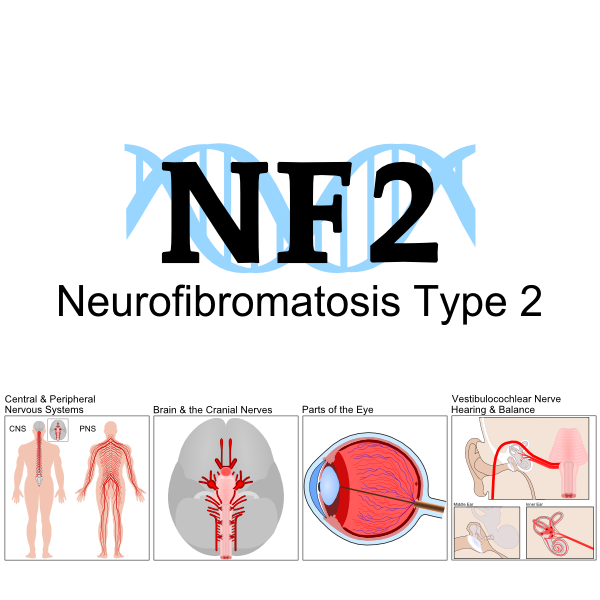 The vast majority of patients of Neurofibromatosis 2 will have some effect on the eye. The most common alteration in young people is Juvenile Cataracts. 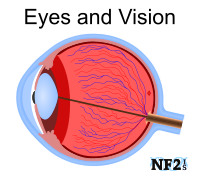 About a third of patients of NF2 will have Reduced Corneal Sensation from involvement of the Trigeminal Nerve. That will actually create a complicated situation. It is the sensation on the surface of the eye that leads to spontaneous blinking. When there's reduced or no sensation on the surface of the eye, that tremendously increases the risk of development of corneal breakdown and corneal ulceration. So it's important to be aware of reduced corneal sensation. About 25 percent of patients will have some form of Nystagmus which can lead to looking at the environment -- whatever you are looking at looks like it's moving because the back of the eye is moving. Dr. Katz: Dr. Smith covered the entrance of the 7th nerve in the ear canal to an opening onto the face and giving off branches to muscles of facial expression. I'm going to restrict most of my discussions to the eyelid and eye closure and procedures which are meant to improve eyelid closure. So underneath the skin is a circular muscle that we call the orbicularis muscle. That muscle is responsible for blinking, both voluntary and involuntary blinking. We all blink every 3 to 5 seconds to rewet the surface of the eye. If we don't blink and tear form breaks up, the corneal surface breaks down. The rest of the orbicularis muscle is responsible for voluntary blinking, which can override the involuntary blinking. Normal eyelid position is referred to in relationship to the Limbus, which is where the color part of the eye meets the white part of the eye. The lower lid typically sits right at the Limbus. The upper lid sits about a millimeter and a half below the Limbus. I will refer to that again as I'm showing you eyelids that are mal-positioned. This is a cross-section through the eyelid just showing you the complex layers of the eyelid. So we start with skin and beneath that is subcutaneous tissue. Below that is the orbicularis muscle. That comprises the anterior layer of the eyelid. Posterior layer is made up of the tarsal plate that creates a structure in the eyelid. It's where the tendon to the muscle that lifts your eyelid inserts. The posterior layer of the eyelid is made up of the tarsal plate. The mucosal surface rubs up against the surface of the eye. When the 7th nerve is not working partially or completely, it creates 7th Nerve Palsy or paralysis. We see a number of different sequelae or complications from that that affects visual function. From the top down, so the brow will droop. If it droops enough, it can actually obstruct the vision. Because the orbicularis is responsible for lid closure, the upper eyelid can be retracted or higher than it should be. And the lower eyelid will tend to lag. Both of those things allow the eye to be more open than it should be. And both reduce the strength of blinking, both voluntary and involuntary. When the eyelid doesn't close completely, we refer to that as a paralytic Lagophthalmos. This creates corneal exposure. The epithelium begins to break down. It causes blurred vision intermittent and eventually more constant. If we don't act to improve lid closure, these circumstances can lead to a situation that you see here, which is Corneal Ulceration. This is a pretty dramatic picture with all the vessels on the surface of the eye inflamed. And the corneal plane is broken down and leads to infiltration and infection. Ultimately this can lead to a situation requiring corneal transplant or even loss of the eye. Rewetting the surface of the eye and also drainage of tears from the surface of the eye depends on the blink reflex. Every time you blink, the surface is rewetted and you create a negative pressure in the tear drainage duct so that after each blink, tears are sucked into the tear-draining system. So loss of that function, sometimes after we get the eyelids back into good position, because those muscles are not intact and are less animate, tear drainage can still be a problem in performance. So patients will experience redness, irritation, tearing, blurred vision, discomfort and often light sensitivity. So there are a few things we can do to protect the surface of the eye. And part of that depends on whether or not we expect the nerve to recover. If the patient undergoes surgical removal of an Acoustic Neuroma, sometimes the surgeon will be able to tell you whether or not they expect recovery of the 7th nerve. Or whether it had to be transected to remove the tumor. Often the surgeon will have some idea of whether or not they expect recovery, depending on the nature of the tumor and the surgery. If we expect there to be recovery, we want to wait to see if there is recovery, we don't want to intervene aggressively unless the eye surface is actually in trouble. Dr. Katz: So we may start with conservative or what we call temporizing measures. These will include conservative measures like the use of artificial teardrops and lubricating ointments. We need to recognize there are thousands of products available at the drugstore in the eye care aisle and there are different levels of artificial teardrops. About 90 percent of them will be the equivalent of normal saline. You place a drop in your eye, and they wash out debris and soothe the surface. In fact, they dry out in 3 to 5 minutes because they are not very viscous. Then there are drops that are typically gel drops like the Refresh Liquigel. Some say longer lasting and longer duration. Most of those last for an hour or two. They need to be placed less frequently and are more helpful. It's important to recognize the more viscous, or thick that the drop is, the longer it will last. But it will also blur the vision somewhat until you blink it out. The most viscous drops are things like Celluvisc®, which can last up to six hours. But it is very gooey and messy and blurs your vision. It can be a very useful thing to protect the surface of the eye. Beyond artificial teardrops there are lubricating ointments things like Lacrilube which are a lubricating ointment or gel that can last 6 to 8 hours. They are gooey and do blur vision. A lot of patients like to use them at bedtime. Other things, the eye is particularly vulnerable at bedtime. If you go to sleep and the eye isn't closed, then the surface will be exposed throughout the nighttime. You may wake up with tremendous redness or discomfort if you develop a corneal abrasion. Sometimes just manually closing the eyelid before you go to bed is enough to keep it closed. Taping the eyelid closed at night may be helpful. Some patients don't like taping over time because the tape ultimately may irritate the skin, and it may become red and tender. Sometimes paper tape is more helpful and gentler than adhesive tape. Other options include moisture chambers, which there are many different options. The simplest, if you don't have access to moisture chambers, to put lubricating ointment in the eye and take a piece of Saran wrap and stick it directly to the ointment. It forms a moisture chamber and works quite well. The surface is protected. There are commercially available moisture chambers. Some, like in this photograph, just are a piece of plastic or attached to a Styrofoam that simply creates a moisture chamber. Some have adhesive tape so it's like a bubble that sticks to the skin around the eye. Some patients have told me they wear swim goggles after putting drops in their eyes. Dr. Katz: Dr. Smith brought up the weights can be stuck to the eyelid as a temporizing measure. We can put in a temporary device, a suture, putting it over a red rubber bolster and temporarily closing the eyelids and leaving the stitches in for two to three weeks. It's a good Temporizing measure. This will allow healing of the surface of the eye. Eventually that has to be removed because the stitches will pull through the tissue if they are left too long. You can do a temporary Tarsorrhaphy. Or you can actually do a permanent Tarsorrhaphy. You actually rough up the margin of the eyelid and put in your Temporizing suture. Where you roughed up the edge of the eyelid will stick together in a more permanent fashion. In this diagram, we call this a permanent temporal Tarsorrhaphy. You determine how much of the aspect of the eyelid you want to close and decide how much of the grade line we are going to remove. Depending on where we remove that, that's where the permanent closure is. That can be helpful. Dr. Katz: One of the things that we do in the long run, not in the short run, is sometimes we end up having to lift the brow up when it's inanimate and hangs down into the visual axis. When it's this dramatic and unilateral, you typically resort to a direct brow lift. There are a lot fancier ways to lift the eyebrows for cosmetic purposes, like in the hairline. When you have a unilateral eyebrow ptosis, you go for a direct brow lift, outlining the skin directly above the brow and you excise that area, that skin and subcutaneous tissue to the layers above the muscle. When we close it, we do it in such a way that it pulls the brow upward. It can work quite well to elevate the brow and the skin of the eyelid that's hanging down into the visual axis. Another alternative is to go to the mid-forehead where there is already a crease. When you do a brow lift directly above the brow, it usually leaves a scar that's visible for 4 to 6 months. Sometimes we will go from the forehead where there is already a crease. This is a photograph showing the muscle after excision and closure. This is actually not a patient with facial paralysis. The patient had tremendous eyebrow ptosis. Sometimes when we have upper eyelid retraction and the upper lid does not come down, one of the options is to place a gold weight in the upper eyelid. Fortunately this doesn't have anything to do with rejuvenation of the muscle. When the muscle doesn't work at this point, nothing we do will improve that muscle function. So the goal of placing a gold weight is simply to get the upper lid to come down better by the effect of gravity. Dr. Katz: In the office, we have sizing tests. The gold weights measure between .6 grams and up to 2 grams, I believe. We can actually stick it to the outside of the eyelid. The goal is to have the lid droop slightly compared to the opposite side. That's often what it takes to get closure. You are trying to balance the eyelid to drop somewhat, but not quite into the visual axis. This platinum weight stuck to the outside of this patient's eyelid, he was able to close completely with no Lagophthalmos. We determine what size to place intraoperatively. We make an incision in the upper eyelid crease and dissect into the layer and put in a fibrous plate. Then we attach the weight. It has three holes. The two lower holes suture directly into the plate. In this diagram, it's showing placement of the weight directly over the tarsal plate. The same in this diagram. I tend to place the weights slightly higher. One of the complications of placing a gold weight, it tends to be very visible beneath the skin. So I like to place them a little bit higher than is shown in this diagram. Typically you have to place a slightly heavier weight to do that. But if you place it slightly higher, then it tends to be less visible. This is a patient, in the upper two diagrams, before the gold weight, looking straight ahead and attempting to close. You can see there is more than a centimeter of Lagophthalmos. In the lower diagram, the patient has had a gold weight placed so the upper lid is lowered, compared to the more normal left side. But when he attempts to close his eyelid, it closes all the way. That's about the result that we are looking to get. Complications: When you put the gold weight in, the lid can be drooped that it blocks the vision. So you can cause it to droop too much. Despite preoperative measuring, you could have persistent upper lid lag which means going back and placing a heavier gold weight. The weight may be visible through the skin. It may lead to an inflammatory response. Gold is inert, it typically doesn't cause inflammation. It's usually, if there is inflammation long term, it's due to lymphedema of the lid. Or it can be a reaction to the sutures. We can get an inflammation that takes weeks and months to go away. That happens on occasion. You are leaving a foreign body, so there is risk of infection which may lead to removing the weight until the infection clears. Occasionally we will get an implant that migrates or extrudes, and we have to remove it and lay a new weight. By and large, it is effective when there is significant lid retraction. And possibly allowing correction. For the lower eyelid, when it is retracted from loss of tone, one of the things we can do is a horizontal tightening. The most common procedure is called the tarsal strip. The lower lid becomes very lax. What we do is make an incision in the lateral campus into an upper and lower portion. The lower portion is resected and you remove some of the skin over the thick tarsal plate. By shortening the lid and removing the tendon, you then use the lateral portion of the tarsal plate and reinsert it inside the orbital rim, essentially tightening the eyelid horizontally and reconstructing the angle between the upper and lower eyelids. By pulling the lower lid taut, it can raise the lower lid into a more normal position. This patient has significant dropping of the lower eyelid. The upper picture shows him looking straight ahead and attempting to close his eye. You can see a tremendous amount of lagophthalmos. This is 10 days after surgery. There is a little bit of swelling above the lower lid, but it's in a much better position. With that repositioning, he is able to close all the way. Steve Lee: We will have a question and answer. Would both doctors answer them, for 10 minutes? Time is precious. Speaker: I have a question about a procedure that wasn't mentioned. I wondered if you know about or do the PALPABLE spring insertion? Dr Katz: I don't. It's still performed. There are some people that love it and do it frequently. It's becoming increasingly less common, due to complications. I have removed quite a few of them. Even most recently, I had a patient; he had a string that was working for 20 years. Then it stopped working. I went in to place a gold weight and take out the spring. It still is done and can be successful. Speaker: I like when you talked about how the gold weight in the upper lid, it will close down. I was wondering if it's possible to do the ones and do what you said about placing it higher? Dr Katz: We do sometimes have to revise a gold weight if they have migrated inferiorly. Or sometimes if they have placed low and there is a Chronic Lymphedema, we can go through the same incision, remove it and either place it higher or put a new one that's slightly heavier. We do revise them occasionally. Speaker: Dr. Smith, I have a question about the connection between the surgeries for facial reanimation and the saliva gland and what can be done to control that When there is excessive saliva. My daughter calls them slobber-fests, and just wets the pillow. Is there anything that can be done for that? Dr Smith: It has nothing to do with rehooking the nerve up to a saliva gland. But therapeutic Botox is a very effective mechanism or strategy to reduce the amount of salvation or hyper-salivation. Actually, when I was a resident at Children's a decade or more ago, with some of the surgeons I was training with, we would treat hyper-salivation with Botox in the hospital on the pediatric population. It works very well. Speaker: Periodically, that has to be done periodically? Dr Smith: Yes. So Botox lasts anywhere from three months in some areas, to six to nine months in certain muscles. We don't know why it lasts longer in one versus another. But, you know, for folks that sweat too much, Botox is an effective strategy. Botox can be used for spasticity disorders. It is also used for migraine headaches. There is a multitude of conditions that Botox effectively treats. But excessive salivation and drooling is one of those. Speaker: Can you speak to the use of a sling to help keep the mouth closed? My daughter's was poorly done. She has had one done. Can you speak to the effectiveness of a sling? Dr Smith: There aren't a whole lot of people that have bilateral facial paralysis. 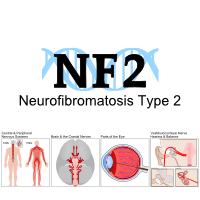 However, in the Neurofibromatosis 2 community, we can see it. And we will either employ a piece of facia from the leg; and basically you are creating a static sling. A static sling is just something put there and it's just there. A dynamic sling is where we have control of the movement. But that static sling has to be tunneled adjacent to that muscle that's not innervated and not working. And we have to anchor it up laterally. That's a technique I will use on occasion just to help reposition that lower lip. Another commonly used technique for lower lip problems is to make the low lip shorter. If you have got -- it's kind of like tightening your belt. If you have got a lip that's just hanging down and you make it shorter, then you have got less floppy lip to deal with. I will usually shorten the lip first, and then would consider placing a sling, if things were still ptotic, or dropped. Speaker: If the sling was not done well, could that shortening be done afterwards? Dr Smith: Absolutely. The risks of surgery are usually risks of hurting the nerve. If the nerve isn't working, then it's just a matter of putting tissues in better positions. So we can remove the Gore-Tex sling and shorten the lip, absolutely. Yes? Speaker: I am trying to get my lower lip to come back out. It disappeared after the last surgery. And the doctor in Atlanta has suggested an injection of Juvederm. That would last about a year. How is that in comparison to the Botox you talked about? Dr Smith: When I use Botox for lower lip problems, I am treating a couple muscles down here; they are called the DAO, or depressor anguli oris. Those muscles, when they have tone, they want to pull the lip down. So if we weaken them with Botox, the lip has an opportunity to come up a bit. Juvéderm can give you a little additional volume to the lip. If your mouth is already closing, and you have got oral competence, your lips are opposed to one another, using a little bit of Juvéderm to plump things up can be a useful adjunct, but it's not going to give you too much of a lift. So we have to manage expectations when we use things like fillers to get more volume there. You can get a little bit, but not too much. Speaker: Do you guys have any experience with Botox traveling to other areas in the body, like your heart or your diaphragm? Dr Smith: No, never. We have been using Botox as a medical community therapeutically for 33 years. So Botox was first used to treat a spasm disorder of the lower eyelid. And it's been used in infants, folks who are up there in the years, age-wise. And as long as you're using good product from a good company, and it's not bootlegged Botox, and being treated by a physician that's comfortable with the facial anatomy, or whatever area they are treating, it's extremely safe. It doesn't travel. Dr Smith: So the question is, are there nerves that have been developed in the laboratory that we can replace existing nerves with that aren't working? Dr Smith: We are not there yet. And maybe we will be some day with good sound research. But until then, we use nerves that are already in the body because they are a great substitution for nerve that's not there. But to reconnect an entire neural pathway, you know, from the brain, through the brainstem, out to the targets with the various ganglia, which is where the cell bodies live, which are the headquarters of each of the nerves, very complex. And so I think it will take a lot of work before we're at that point. So in the meantime, we just -- we use nerves that are already in the body and try to bypass the parts of the nerve that are either broken or not working or have been injured. That's where we are at in 2013. Speaker: I was wondering about the nerve regrowth you were talking about. You said about a centimeter a week or something. Is there any way to tie into natural regrowth in order to regrow the function of a nerve? Dr Smith: Most of my time is spent clinically -- most of my time is spent treating patients clinically; and so as far as speeding up nerve growth beyond a millimeter a day, that's a difficult challenge. I'm an impatient person, and it just happens to be, you know, we have to -- it's the tincture of time with nerve regeneration. Speaker: Since you both work together sometimes in surgery, do you ever see patients together, you know, if they have multiple problems, say, to do with the eye and the face, and given an assessment that would be, you know, like a collaboration? Dr Smith: We never work in the same clinic. But he is on the fifth floor and I am on the fourth floor. It's very common I will run upstairs into one of his exam rooms, or Dr. Katz will come down to the fourth floor and take a look at a patient for me. So we are on different floors, but we call each other probably every time we are in the clinic, saying, hey, can you.... So we do collaborate heavily. Thank you. The last, last question? Speaker: My question is for Dr. Katz. I have essential tremors which makes my head move. Is there anything, any help at all available if you have that condition as a result of surgery? Dr Katz: There is no easy answer to that question. For Nystagmus, which is not what you are talking about, we try injecting Botox beneath the surface layer of the eye which seems to blunt Nystagmus. But patients don't notice an improvement in their vision. We tried a surgery where we clip the horizontal muscles and just place them back. It seems to blunt Nystagmus. Again, it's not clinically significant to the patients. For essential tremors, sometimes Botox will lessen the tremor. Medications, we use Baclofen, carbamazepine, antiseizure medications. All of them have been used with limited results. Some patients will find them to be useful over time, maybe not as useful. Steve Lee: Okay. Up next this morning, speaking to us from the NF2 community with CTF, we have Tracy Galloway. Tracy? Tracy is going to speak to us this morning. She is our advocate for NF2 with CTF. Thank you. Tracy Galloway: Hey, everyone. 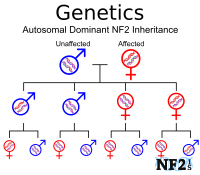 Really, I am an advocate for you all and my daughter, who has NF2. I am on the board of Children's Tumor Foundation to advocate for all of you who have NF2. I want to talk to you about something so important and pushing it so hard within the Children's Tumor Foundation. Can I ask, if you feel comfortable with a show of hands, who is registered through the patient registry? Have any of you signed up with the patient registry? Okay. Speaker: Say that last part again. Tracy Galloway: The NF Patient Registry, have any of you signed up for it? Tracy Galloway: I am here to convince you, urge you strongly, to sign up for the patient registry! Let me tell you why we need to do that. The patient registry is our voice to the research and the pharmaceutical companies that we are definitely a defined population that has a disorder that needs a treatment. If we do not have a significant number of people in this registry, they will not listen to us. So it's very important. 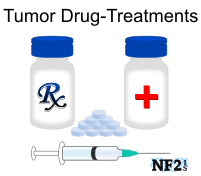 When Annette, our chief scientific officer, goes and talks to the pharmaceutical companies on your behalf about potential drug therapies for NF2, they will ask her, do you have a patient registry. We need at least 10,000 -- at least 10,000 people in the patient registry. We are now at 2,800 people. It takes like 5-10 minutes to sign up. It's not complicated; it's not difficult. It's very safe. They have protected you in this registry. They are not going to let anything happen with your information. And it takes about 5-10 minutes. So the registry helps to establish us as a patient community. It helps consolidate the data. It helps researchers and scientists and clinicians partner in different ways with lots of entities. And it also helps to streamline the process. So I strongly urge you, please, I mean, we need this registry. If you want therapy, people are asking me, we need a therapy or treatment. My first question to them is, have you signed up for the registry? Take the 5-10 minutes, sign up and encourage family members to do so. All you do is go to www.CTF.org. There is a tab in the upper right-hand corner that says, how can you help. Underneath that tab is "Join the NF Registry." It's that simple! Thank you very much.